Hi friends..Welcome to AYESHA'S KITCHEN. Today am back with an easy, quick pickle recipe with Bitter gourd specially for all bitter gourd lovers. For reducing the bitterness, bitter gourd is sauteed in tomato gravy until mushy and then pickled. And i used tamarind instead of vinegar, so this pickle must be refrigerated and used within a week. But don't worry, they will vanish off soon because of its nice tangy flavor. 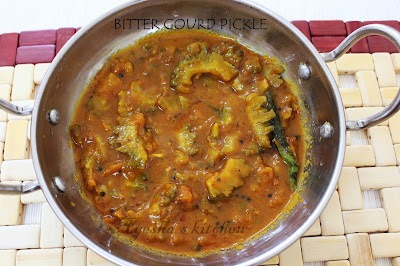 Here is the recipe of how to make bitter gourd pickle / pavakka achar / kaipakka achar Kerala style. Heat oil in a wok, splutter mustard seeds. When done, add bitter gourd pieces and tomato slices together. Cook until bitter guard and tomatoes are well done. Then transfer it to a bowl. Now in the same wok, add tamarind squeezed water, turmeric powder, ginger garlic paste and kashmir chili powder. Let it boil until the gravy becomes thick and then add the sauteed bitter gourd and tomato to it. Mix well and check for salt. Let it cook in a low flame for few minutes until oil separates. When done, add curry leaves and powdered fenugreek to it and mix well. Once cooled, ready to use. Can store in an air tight container and keep refrigerated for long use ( 1 week ).